Heat Ghee in a wide pan. Add the grated coconut and fry for few minutes. Add the grated jaggery and salt mix well. In few minutes, jaggery will start melting. Allow the coconut to cook in the melted jaggery syrup. Stir continuously until the mixture becomes thick and does not stick to the sides of the pan. Switch off the flame and let it cool for few minutes. When the mixture is still warm, apply ghee in hands and make small balls to form the ladoo. Garnish the ladoos with cashew nuts. 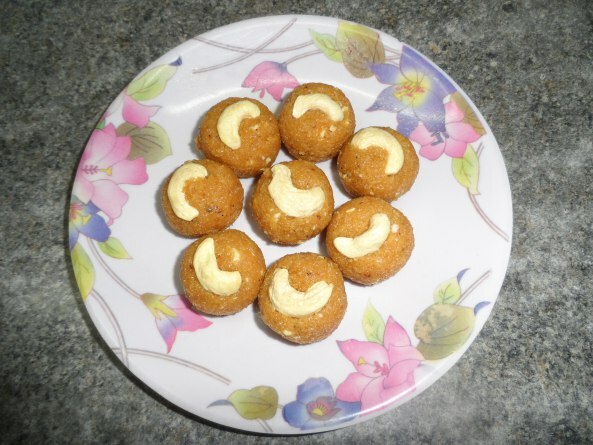 Delicious Coconut Ladoo is ready to taste.